Most folks know the Rio Grande is a natural barrier dividing the United States from Mexico. In 1789, when Spain still had Mexico, Spaniards established a fort and called it "Presidio de San Elizario." A town grew up around the fort and it soon took the name San Elizario. 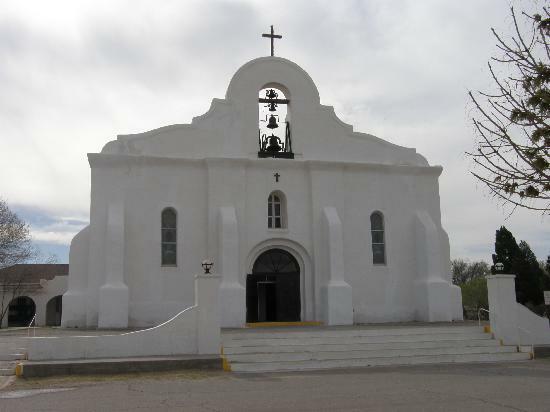 Fact is, the term San Elizario is said to be a corruption of "San Elceario" which is Spanish for Saint Elzear. Saint Elzear of Sabran is the Roman Catholic Patron Saint of Soldiers. During the Mexican-American War, after San Elizario was occupied by the U.S. troops, volunteers from California were stationed at the Presidio to prevent the re-occupation. Prior to major water-control projects on the Rio Grande, such as Elephant Butte Dike which was constructed in 1911, the river was known to flood regularly. The river stayed the same until an 1831 flood changed the course of the river. That 1831 flood left San Elizario on a new island between the new and old channels of the Rio Grande. After the Civil War there were a number of changes created in the political landscape of West Texas. The end of the war and Reconstruction brought many "entrepreneurs" to the area. Some were northern carpetbaggers. It is said that there were three groups that made up the Republicans in the South after the Civil War, and Southerners referred to two with derogatory terms. "Scalawags" were Southerners who supported the Republican Party, "carpetbaggers" were opportunists who were recent arrivals in the region from the North, and Freedmen who were freed slaves. Most Republicans coming there settled in Franklin, Texas, which was a trading village across the Rio Grande from the Chihuahua city of El Paso del Norte, which is present-day Ciudad Juárez. Many San Elizario families had deep roots there and didn't readily accept newcomers. At the same time, about the beginning of the 1870s, the Democrat Party had begun to reclaim political influence in the state of Texas. But frankly, Democrat operatives with ties to the Confederacy were not accepted by the people of San Elizario either. And though that was the case, soon alliances shifted and rivalries developed between the Hispanic community, the Anglos there, the Republicans, and the Democrats residing in West Texas. 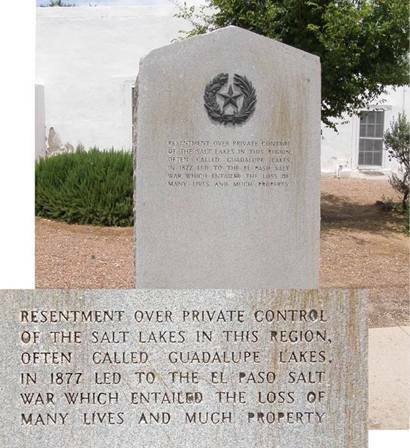 The San Elizario Salt War is also known as the Salinero Revolt or the El Paso Salt War. So what was the San Elizario Salt War about? Well, salt. 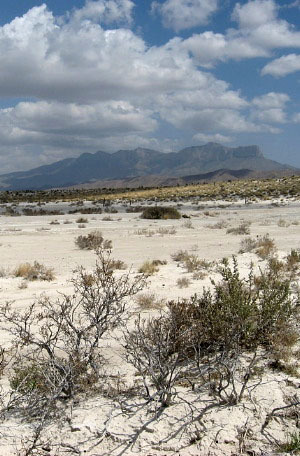 At the base of the Guadalupe Mountains, about 100 miles northeast of San Elizario, lies a number of dry salt lakes. Before the pumping of water and oil from West Texas, the area had a periodic shallow water table, and capillary action drew salt of a high purity to the surface. This salt was valuable for a wide variety of purposes. Salt is 39 percent sodium, a chemical element that is necessary for our survival. Sodium controls a number of our bodily functions. Our need for salt is absolute and we are forced to seek for our health. But besides salt for our physiological needs, we used salt was used to cure and preserve meat long before the advent of refrigeration. And yes, salt was necessary for treating leather, and stabilizing dyes. It was also used for bartering. And of course, salt was an essential element in the "patio process" for silver mining for the extraction of the silver from ore.
Salt is so important to both humans and animals, that we both subconsciously know when salt is needed. An example of this is that animals are attracted to salt licks and salt springs. And yes, it is said that Native American Indians often lay in ambush at such places or created artificial salt licks to lure the animals. Historically, caravans to the salt lakes traveled either down the Rio Grande and then straight north or via what later became known as the Butterfield Overland Mail route. Salt deposits located in the Guadalupe Mountains are 110 miles east of El Paso. They produced salt that was almost chemically pure. It was a two to three day journey to retrieve salt and return home. In 1863, the people of San Elizario, as a community, built by subscription a road running east to the salt lakes. The residents in the Rio Grande valley at El Paso were granted community access rights to the lakes by the King of Spain, and those rights had been grandfathered in by the Republic of Mexico and then again with the Treaty of Guadalupe Hidalgo. So when, beginning in 1866, Texas began allowing individuals to stake claims for mineral rights, the grandfathered community rights were overturned. This did not make for happy locals who had been getting salt from that salt lake for almost a hundred years. To make matters worse, in 1870 there was a group from Franklin, Texas, who tried to claim the salt lakes deposits. This sparked a fight over ownership. And yes, a fight over control of the land began. Albert Jennings Fountain and his "Salt Ring" favored county government ownership with community access. Then when Fountain was elected to the Texas State Senate, he began pushing his plan. But, when the Republican's loss control of the Texas state government in 1873, Fountain left El Paso for his wife's home in New Mexico. In 1872, the Army withdrew troops from both Fort Bliss and Fort Quitman, near San Elizario, and left the El Paso area without a military presence. In this year, Charles Howard came into town. Howard was said to be Virginian by birth, but from Missouri. He came to the region determined to restore the Democratic Party to power in West Texas. In the summer of 1877, Howard filed a claim as owner of the salt lakes in the name of his father-in-law, George B. Zimpelman, who was an Austin capitalist. Howard offered to pay any "salinero" laborers who collected salt the going rate for its retrieval, but he insisted the salt was his. The Tejanos of San Elizario formed committees known as "juntas" in San Elizario and the largely Tejano neighboring towns of Socorro and Ysleta, Texas, to determine a community-based response to Howard's action. During the summer of 1877, they held several secret meetings. 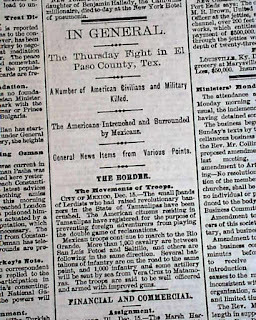 Then in 1877, anger gave way to a an armed conflict which was waged by the Mexican inhabitants living on both sides of the Rio Grande near El Paso, Texas. Their target on the American side of the river was a leading Texas politicians supported by the Texas Rangers. The right of individuals to own the salt lakes previously held as a community asset was established by force of arms. On September 29, 1877, Jose Maria Juarez and Macedonia Gandara threatened to collect a wagon load of salt. When Howard learned of their activities, he had the men arrested by Sheriff Charles Kerber and went to court in San Elizario to legally restrain them that evening, armed men arrested the compliant jurist. Others went in search of Howard, locating him at Sheriff Kerber's home in Yselta. Under the leadership of Francisco "Chico" Barela, they seized Howard and marched him back to San Elizario. And for three days, Howard was held as a prisoner. He was guarded by several hundred men led by Sisto Salcido, Lino Granillo, and Barela. On October 3rd, he was finally released upon payment of a $12,000 bond and his written relinquishment of all rights to the salt deposits. Howard left for Mesilla, New Mexico, where he briefly stayed at the house of Fountain. He soon returned to the area, and in October met up with Louis Cardis in an El Paso mercantile store. 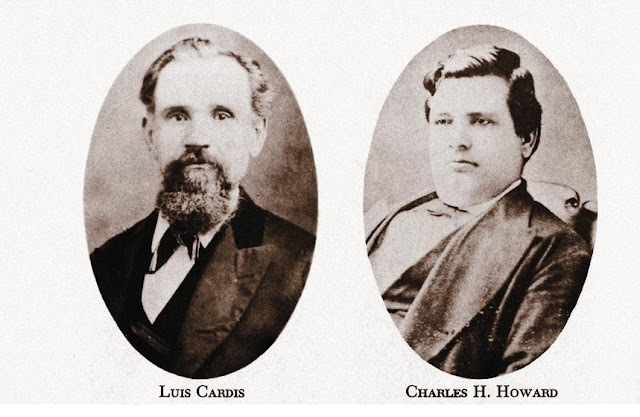 Louis Cardis moved to El Paso, Texas in 1864. He quickly learned the Spanish language and established a political power base with the Mexican American citizens of the area. Cardis favored the Hispanic community concept of commonwealth. He became involved in a dispute involving salt deposits and the shifting of influence and political power from the Hispanic population to the Anglo. He was elected to the Texas House of Representatives with the help of Charles H. Howard. Cardis and Howard with political allies. Problems escalated and soon Cardis had a falling out with Howard. That was because Howard staked an exclusive claim to the salt deposits. Cardis had his allies actually arrested Howard and imprisoned him. After he was let out, Howard retaliated by shooting Cardis to death with a shotgun on October 9, 1877. Howard then fled back to New Mexico. "On… October 10… Cardis entered the store of E. Schutz and Brother, and asked one of the clerks to write a letter for him. He was sitting in a rocker with his back to the door when… Howard enter[ed] the front door with a double-barreled shotgun…. Cardis immediately rose, passed behind the clerk, and took a position back of the desk which concealed the upper part of his body. Howard emptied one barrel into the lower part of [Cardis’] body and legs and as the torso sank into view, the second charge of buckshot penetrated his heart.” according to The Texas Rangers by Walter Prescott Webb. The Tejano people of El Paso County were outraged. They effectively put a stop to all county government, replacing it with community juntas and daring the sheriff to take any action against them. In response to pleas for help from frightened Anglo residents, Governor Richard B. Hubbard answered by sending to El Paso Major John B. Jones, commander of the Texas Rangers' Frontier Battalion. Arriving on November 5th, Texas Ranger J.B. Jones met with the junta leaders, negotiated their agreement to obey the law (or so he thought) and arranged Howard's return, arraignment, and release on bail. Jones also recruited 20 new Texas Rangers, the Detachment of Company C, under the command of Lieutenant John B. Tays, a native Canadian. John B. Tays was a mining engineer, El Paso land speculator, and some say a known rustler of Mexican cattle. Then on December 12th, 1877, Howard returned to San Elizario with a company of 20 Texas Rangers led by John B. Tays. As soon as they arrived, a large group of armed citizens, some say as many as 500, engaged Howard and the Rangers. The mob was enraged and demanded Howard be surrendered. Of course Howard and the Rangers immediately took cover in the buildings, and soon took refuge in the town's mission where they tried to claim sanctuary.After a two-day siege, Texas Ranger John B. Tays surrendered the company of Rangers. And yes, it is believed that was the only time in the history of the Texas Rangers that a Ranger unit ever surrendered to anyone. So yes, on December 17th, he gave himself up to the mob which quickly organized a firing squad. And one source states that after they fired, The bodies of Howard and two of his agents, Ranger Sergeant John McBride and former lawman John G. Atkinson who were also shot by the firing squad, were hacked to pieces and then dumped down an old well about a half mile away. As for the rest of the Texas Rangers there that day, it's said they were humiliated by being disarmed and then run out of town. And though the Texas Rangers surrendered, no one should say they weren't any good. Fact is, they faced overwhelming odds. After that Mexicans there rioted and looted the town, sacking the buildings, and lawlessness reigned until Buffalo Soldiers of the 9th Cavalry and a sheriff's posse from New Mexico arrived on scene. Once they arrived hundreds fled to Mexico, some permanently. Among them were the civic leaders of San Elizario. 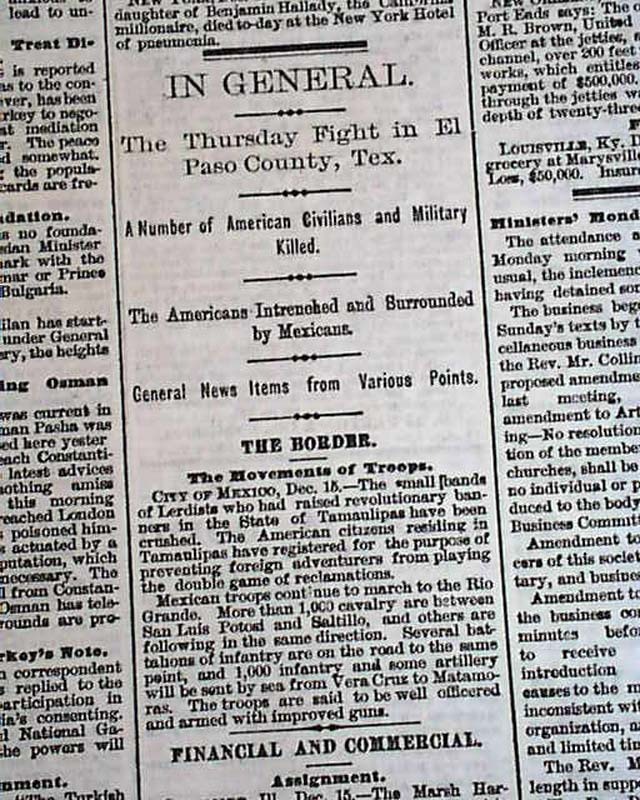 The conflict is said to have climaxed with the siege and surrender of 20 Texas Rangers to a mob of perhaps 500 Mexicans in the town of San Elizario, Texas. And in all, 12 people were killed and 50 wounded during that fight alone. So yes, for over twelve years following the Civil War, political and legal struggles took place among Texas politicians and capitalists over salt. It began as a local fight and over time grew into an armed conflict. Newspaper editors throughout the nation covered the story and made it bigger than it was. They included lurid detail that some say are questionable. Yes, pure sensationalism at its best. And remember, this went on for 12 years. In fact, over those years, it's believed that as many as 650 residents bore arms against the local authorities. Also in those 12 years, it is believed that about 20 to 30 men were killed. Of course, it is reasonable to say that double that number were wounded over the years. Yes, over salt. After the dust settled, damage to property was estimated at $31,050. Crop losses were sustained, because local farmers did not till or harvest their fields for several months. The wheat loss alone was estimated at $48,000. To these immediate financial losses was the loss of further political and economic power of the Mexican-American community of El Paso County. As a result of the loss of political and economic power, San Elizario lost its status as county seat. Especially since the town's population decreased. The county seat was relocated to Franklin which became El Paso. Though Fort Bliss was first established in El Paso in March of 1854, it was relocated in the late 1860s. Because of the salt war, the 9th Cavalry Buffalo Soldiers were sent there to re-establish order and actually had to re-establish Fort Bliss to keep an eye on the border and the local Mexican population. It's true, on New Year's Day in 1878, Fort Bliss was established as a permanent post just to keep and eye on things down there. Company L Buffalo Soldiers of the 9th Cavalry and Company C of the 15th Infantry, were sent to Fort Bliss to prevent further trouble over the salt flats and to help enforce regulations regarding the usage of Rio Grande water for irrigation purposes. It is interesting to note that prior to this date, the U.S. government had a policy of simply leasing property for its military installations. And besides the U.S. Army establishing Fort Bliss, it's said that when Southern Pacific Railroad came to West Texas in 1883, it bypassed San Elizario altogether as punishment. How you see what transpired might depend on how you view our government. For example, it is said that the Mexican-American uprising was a bloody riot by a "howling mob." Of course the "mob" has also been described as "an organized political-military insurgency with the goal of re-establishing local control of their fundamental political rights and economic future." Some say it is an example of Mexican-Americans not being treated as equal citizens, and instead being treated as a subjugated people. Others see the San Elizario Salt War of 1877 as an example of Americans being pushed too far and taking up arms to fight government oppression. For me, I believe that the people there felt that they had to take up arms as a last resort to obtain a solution to a dire situation that was created by politicians. That might not make it right, but I believe that that's how it was because salt was so essential to life at the time. And yes, that's the way I see things.